Left: My black and white collage of photos I took at various concerts in 2010. Top Right: Leonard Cohen and The Rose of Katowice, photo taken by me. Bottom Right: Father and Son, Leonard and Adam Cohen. Photo taken by Lorca Cohen. Friends of mine on both Facebook and The Leonard Cohen Forum will recognise the rose photo here as my favourite photo that I have ever taken and the one regret I had from when I met Leonard in Las Vegas was that I didn’t have this photo with me. Leonard and music aside my other passion in life is photography so when I can combine music and photography I am at my happiest. I also love black and white photography so I printed the black and white collage of photos I had taken on the previous tour when getting the rose photo printed. I made sure to bring these photos with me to Ghent, just in case I did meet Leonard again, never daring to really think lightning can strike twice. I also had a dream of getting the photo of Leonard and Adam signed by both, but also not daring to dream too much. I knew there would be a very good chance of seeing Adam after his concert as he does meet and greets, so when I met him he personalised it for me so Leonard wouldn’t have to should the miracle happen! Adam was really touched when he saw the photo holding it up for everyone to see saying “Look everyone, it is a photo of me and my father”. Lightning does strike twice sometimes and it did again for me. I had went to Ghent prepared and had a silver pen with me but in my excitement at seeing Leonard I’d left it in my bag and left my bag at our table! When I asked Leonard would it be ok to go and get it he replied he had a silver pen, always prepared for if he met his fans, always the gentleman. The pen had to be silver for the writing to show up on the photos. I first showed Leonard the photo of him and Adam and he was very impressed and then saw Adam had already personalised it for me. I told Leonard this was to save him time. I then showed him the black and white collage and finally my rose photo. I was very touched and still am that when I asked Leonard to personalise it for me that he did and he signed it Leonard instead of his usual full name. 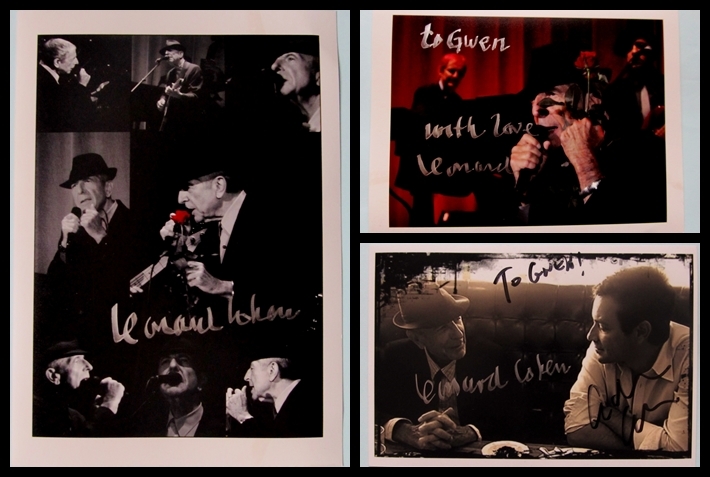 I’m still in shock that I actually spoke to Leonard again and have these precious momentos to treasure forever. Thank you Leonard and Adam for making my dreams come true and for continuing to do so over and over again. This entry was posted in Adam Cohen, Ghent, Photos and tagged Adam Cohen, Leonard Cohen. What a Lucky!!!!!!!! my regards from Spain!!!!!!!!!!!!!!! !